Stockholm: Reader's Digest Aktiebolag, 2006. 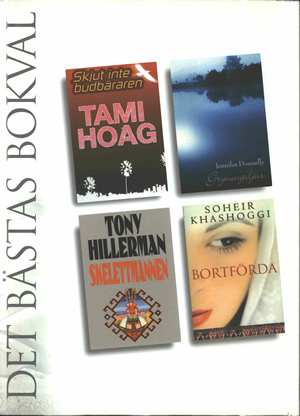 This is a Reader's Digest compilation volume (Det Bästas Bokval) of four novels: Skjut inte budbäraren (Kill the Messenger) by Tami Hoag, Gryningsljus (A Northern Light) by Jennifer Donnelly, Skelettmannen (Skeleton Man) by Tony Hillerman, and Bortförda (Mosaic) by Soheir Khashoggi. It was published in 2006 by Reader's Digest Aktiebolag in Stockholm. The front cover displays DET BÄSTAS BOKVAL vertically in gray along the spine, with thumbnails of the covers of the four included novels on a white background. The back cover shows DET BÄSTAS BOKVAL vertically in gray along the spine, author photographs and names on a white background, with praise for each author from other publications. DET BÄSTAS BOKVAL, the titles and author names of the four included novels, and the Reader's Digest logo are printed on the spine. The inside front and inside back flaps contain synopses of the four included novels. Binding: Dark grey coated material. Logo embossed in lower right corner of front cover. "DET BÄSTAS BOKVAL," the titles and author names of the four included novels, and the Reader's Digest logo are printed on the spine in gold.